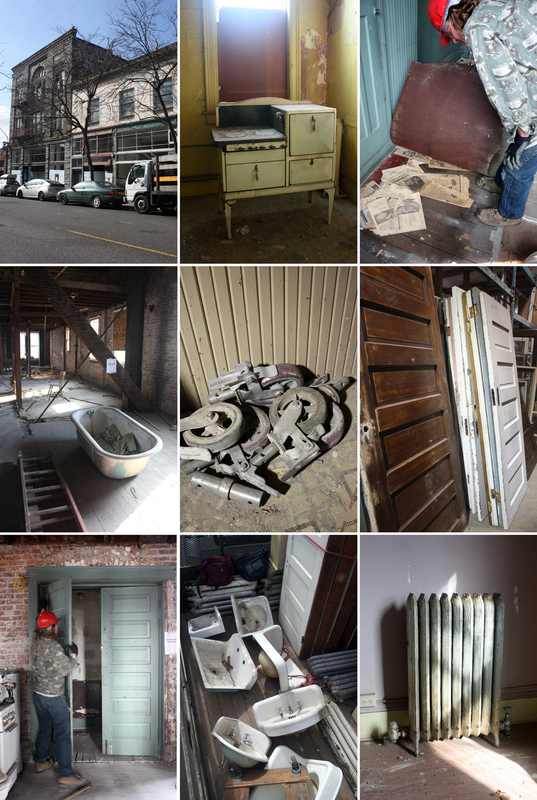 The RE Store’s Seattle field crew had the recent privilege of salvaging the stately, if not slightly dilapidated, G.B. Sanborn building on historical Ballard Avenue. The three story Romanesque structure was named in honor of Ballard businessman Gustavus B. Sanborn (G.B. to his friends) and opened its doors as a hardware store in 1901. Unfortunately, ol’ G.B. passed away shortly thereafter; however, his building has lived on in various forms, including stints as a department store and even a dry goods company. Thankfully, the Sanborn’s future will remain secure. As of April, the 102 year old structure was undergoing an extensive and well-deserved retrofit that will preserve much of its original character. The project’s contractor enlisted Ballard’s own RE Store to salvage interior fixtures that were otherwise slated for the debris pile. Items at the top of our architectural salvage list, and at the top of two flights of stairs, included the Sanborn’s original compliment of ornate cast-iron radiators, cast-iron wall mount sinks, fir panel doors, tin-clad swinging doors, and claw-foot tubs. For those of you wondering why antique claw-foot tubs are so expensive, it’s because they’re typically removed from the second floor of a building with plenty of rickety stairs and no elevator. We began our salvage of the Sanborn by removing over two-dozen original fir panel doors complete with their true 4”x4” jambs. The field crew typically uses a reciprocating saw to cut through the nails that secure the doorjamb to the studs, but it’s sometimes preferable to do it the old fashioned way with a large pry bar. Using the pry bar reduces the amount of dust emitted into the air and eliminates the sparking and friction caused by cutting through nails and shims. Once removed, the door and jamb are screwed together for safer handling. Because schlepping around two-dozen hung doors wasn’t enough fun, we moved on to radiators. After all, cast-iron radiators and stairs go together like peanut butter and jelly. The most practical way to move a radiator down a flight of stairs is by securing it to a hand truck. There is a brief thrill of mechanical advantage as you wheel the iron beast to the edge of the landing, but then you go over the falls, and it all comes down to good old person power. In all, the Seattle field crew removed over a dozen cast-iron radiators, but it felt like a lot more. Inevitably, the process of salvaging an old building like the Sanborn will reveal bits of local history and even a record of changing tastes. For example, we unearthed two beautiful sets of sliding fir library doors that had been totally encased behind closets built out from the walls. Like the current renovations to the Sanborn, these changes may have been made to make the space more inhabitable or may have been an individual preference. Whatever the case, The RE Store was happy to be involved in saving a little bit of Ballard’s history, no matter how heavy it was and how many stairs were involved. Come check out all the loot brought back from this historical Old Ballard Ave building – most of the items are at the Seattle store, but Bellingham received some of the 5 and 6 panel doors last week. Keep up with other ‘cool new things in the stores’ by signing up for our e-newsletter, Salvage Times here.